As we are getting to polishing up a patch for next week with the system changes mentioned in the previous post, we’d like to talk a bit more about the system what’s going to be included. If you’ve met us in person or talked to us about Spaera, you’ve probably heard us talking about what we feel the shared piece deck means to the game. In our minds, the central deck is one of the core components of the game. It opens up the potential for consistent and direct interaction with the other player and enables players to speed up or slow down their pace to fight for pieces. Ideally there are favorable pieces that players fight for, and hard to use pieces that players actively avoid and try to force the opponent to acquire. We consider this mechanic to be like “footsies”, which is a term commonly used in fighting games such as Street Fighter to describe the control of space between fighters either through movement or through actively using moves and abilities. In the current system, however, making a split-second decision on whether a certain piece is unfavorable to your opponent can be quite a daunting task. We wanted to highlight the favorable and unfavorable pieces better and at the same time free up some of the player’s attention in order to take advantage of these pieces. 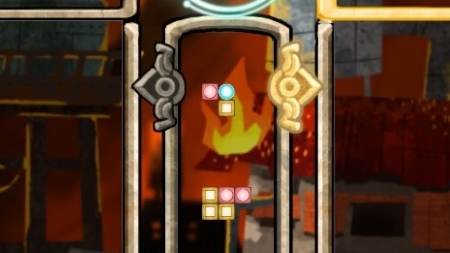 In the current test build, we reduced the number of colors on playable pieces down to 3. This preserves the match and cascading mechanics but frees up some mental bandwidth so players have less colors to worry about matching. We also added more piece shapes and color patterns to shift more of the decision making process to piece selection as opposed to piece placement. What this does is reduce the load on identifying what clear-able colors an opponent has and allow for better recognition of whether an incoming piece from the deck is a harder to clear shape and is likely to be undesirable for the opponent. This ties back to our last blog post about end-game survival. These changes should open up more options for players to proactively finish an opponent. We would like to emphasize that this is a large step that we are taking in what we feel is the right direction for the game. This means that we haven’t finalized everything and more changes are coming as we get more feedback from all of you. Thank you for your continued participation in our Spaera Early Access build and stay tuned! Nice to see that it’s being worked on.